SOUTHWEST MIAMI-DADE, Fla. - Republican congressional candidate Carlos Curbelo defeated Democratic incumbent U.S. Rep. Joe Garcia in the race for District 26. Curbelo received 52 percent of the votes, while Garcia received 48 percent of the votes with 94 percent of the precincts reported. Garcia told Local 10 News that he called his opponent shortly after the race was determined to congratulate him. He later released a statement saying, "While tonight was not the result we were hoping for, I am proud of the race we have run and so grateful for the countless South Floridians who have supported my campaign and my service these past two years. I have called Carlos Curbelo and expressed my hope that he will serve, as I have, by putting the people of South Florida over party politics. My life has always been shaped by a deep commitment to service and problem solving, and I look forward to finding new ways and new avenues to continue practicing these values in pursuit of doing good for our community, our state and our country." Earlier in the day, Garcia hit the campaign trail as one of the most competitive races in South Florida proved to be neck-in-neck throughout the bitter race. Garcia tried to win a second term against Republican challenger Carlos Curbelo. The congressman made three campaign stops early in the day, kicking things off in the Hammocks and later meeting with voters at numerous precincts in the area. Garcia ended the day with volunteers and staff in the Hammocks. Meanwhile, Curbelo started his day in Country Walk before meeting with voters at a precinct at Ferguson Senior High School. He continued to meet with supporters for about an hour at several voting locations before ending the day at a Kendall branch library before the polls closed. On Monday, Garcia joined dozens of volunteers at a phone bank event. The chairwoman of the Democratic National Committee, U.S. Rep. Debbie Wasserman-Shultz, was also on hand to call likely Democratic voters. "These congressional races in districts that are really tight make you work really hard to make sure people know what you're doing," said Garcia. "There are a few who say, 'I'm still reading and watching TV to decide which way to go,'" said Ron Gilbert. Curbelo practiced retail politics on Monday by going door-to-door in a southwest Miami-Dade neighborhood, targeting likely Republican voters. "I think people are sick and tired of the history of both parties causing trouble in this district. 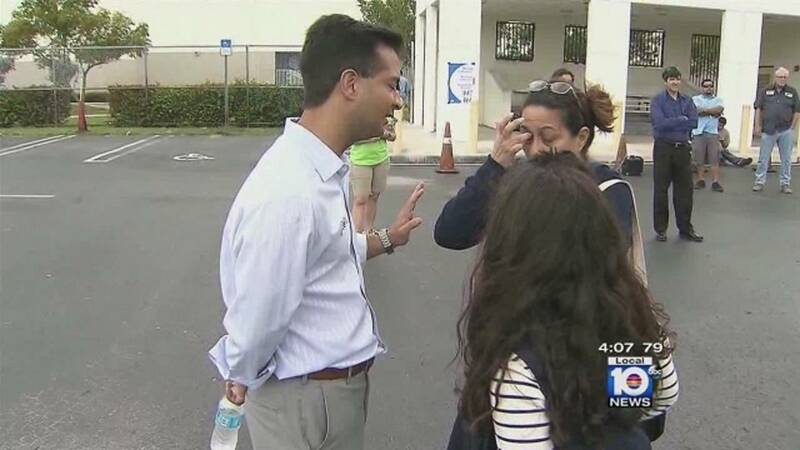 It's given us a bad name," said Curbelo. Both candidates said they were feeling good about Tuesday night even though most polls showed the pair extremely close in the race. The candidates have spent nearly $14 million combined in mostly attack ads during their fight for District 26. Florida Democratic Party Chair Allison Tant released a statement shortly after the race was called saying, "Joe ran a strong, hard-fought campaign that made Democrats and South Floridians proud. He stood strong for the values he's fought for every day in Congress — growing Florida's economy from the middle class out, protecting Social Security and Medicare, and working to expand the American Dream to those all who seek it. I am proud of the work Joe accomplished in Congress and of the campaign he and his team ran."